Fairtrade products have had a lot of bad press recently, but it is an important concept to which I feel we should adhere. As far as chocolate goes, according to the Fairtrade Foundation, Fairtrade is enabling small scale farmers in Cote D’Ivoire, Ghana and the Dominican Republic to trade their way out of poverty. This is done by not only giving them a premium on the price they get for their cocoa but giving them long term contracts which provide stability allowing them to invest in their farms and communities. For more information on how lives in West Africa have been improved by Fairtrade, you can read the report from Fairtrade International, published earlier this year. Divine was one of the very first chocolate companies to adopt the Fairtrade ethos and they have remained true to their principles ever since. The company is unique for a British mainstream chocolate business in that it is part owned by a co-operative of cocoa farmers in Ghana. You can read all about it here. Divine are one of the main sponsors of Chocolate Week. They have come up with two new chocolate bars as well as some new chocolate recipes especially for the occasion. I’m very keen to try both the 70% dark chocolate with mango and coconut and the milk chocolate with almonds. They have also helped organise a number of events around the country. Visit their website to find out what and where these are. Living in Cornwall, means it is not always possible to attend some of the food events I would ideally like to. A celebration of twenty years of Fairtrade held in London a couple of months ago was one such. The diversity of products now out there carrying the Fairtrade label is really quite amazing. I remember when there was only tea, coffee and chocolate and they were hard to find. As I was unable to make the celebration, I was kindly sent a few of the products that were being showcased on the day. One of these was a bar of Divine chocolate. 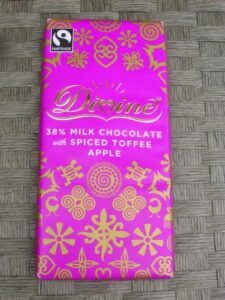 Divine Milk Chocolate (38%) with Spiced Toffee Apple – I was very excited by this new bar on the block, not a flavour combination I’d come across in chocolate before. With the apple season fast approaching I wanted to keep this for a suitable appley occasion. Turned out this was Bonfire Night and I made these rather wonderful spiced toffee apple bonfire cakes. But meanwhile, I had to try a little of it. A mixture of apple pie and toffee apples, this was as good as I was hoping it might be. Pieces of crunchy toffee and chewy cinnamon flavoured apple punctuates Divine’s signature high cocoa content milk chocolate. One piece lasts a satisfyingly long time and leaves fruity spicy notes in the mouth which are just perfect for autumn. Divine has always decorated its outer wrappers with traditional West African symbols called Adinkras, each of which has it’s own special meaning. This was the first Divine bar I’ve seen where the Adinkras are imprinted on the chocolate itself. Thanks to the Fairtrade Foundation for sending me these products to try. I was not required to write a positive review and as always, all opinions are my own. I defo love the idea of the lemon and chocolate tarts and I like divine chocolate too so off to have a nosey. Yes, those tarts sound good Bintu and I’m pleased to hear you’re a Divine fan – they are a company well worth supporting and their chocolate’s really good too. oooh, I love the lemon and chocolate tarts and the Divine packaging is… divine! Those lemon and chocolate tarts are getting far too much attention. It’s looking increasingly likely I’m going to have to make them! I’m a bit of a Divine fan too, and do always look out for fairtrade choccie where possible. Loving their new Spiced Toffee Apple flavouring, and shall be looking out for it, sounds very unusual. And both recipes look very tempting! It’s very nice chocolate Lou and I’m hard put to hang on to it for the bakes I have in mind – it’s got to last until tomorrow! Good Afternoon to you, I have never used heard of, or used Divine products, so I was interested to read the information about the company. I do love the sound of the new spiced toffee and apple chocolate…. I do love chocolate and yes I’m afraid I have to add my name to the list, I really love the sound of the lemon and chocolate tarts…. they really do look fabulous. Divine rocks in both the chocolate and business world! ooh spiced toffee apple, how can you go wrong with those flavours. Enjoying your chocolate week posts Choclette. It’s very yum Alicia and so were the cakes I made with them this morning. You are fast becoming the ‘go to’ expert on chocolate!! Thanks Heidi – hopefully I was already that!